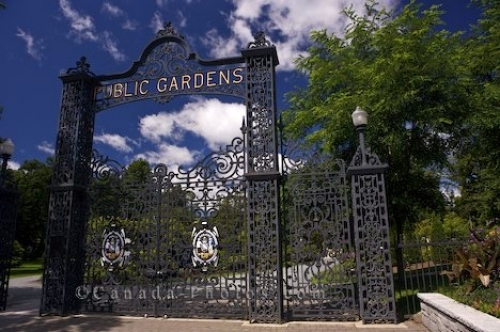 The Halifax Public Gardens in Nova Scotia, Canada were opened to the public in 1875 and since, the landscaping inside the wrought iron fence has been updated and tended to with a great amount of care. These gardens are open yearly to the public from May 1st to November 1st and then the wrought iron gate is once again locked for the winter season. Wrought iron gate at the entrance to the Halifax Public Gardens along Spring Garden Road, downtown Halifax, Halifax Metro, Halifax Harbour, Nova Scotia, Canada. The Halifax Gardens were opened to the public in 1875. Picture of the beautiful wrought iron fence at the Halifax Public Gardens in Halifax, Nova Scotia in Canada.